Rosa rugosa Waldoboro, 2014. Oil, acrylic, and gold leaf on canvas, 84 x 60 inches. Black-eyed Susans, 2014. Oil, acrylic, and gold leaf on canvas, 84 x 60 inches. Quince, 2014. Oil, acrylic, and gold leaf on linen, 84 x 60 inches. Homecoming, 2014. Oil, acrylic, and gold leaf on canvas, 72 x 36 inches. Blue Succulents, 2014. Oil, acrylic, and palladium leaf on canvas, 72 x 72 inches. Phlox, 2014. Oil, acrylic, and gold leaf on canvas, 84 x 60 inches. Bellflower, 2014. Oil, acrylic, and gold leaf on canvas, 84 x 60 inches. Malinalco, 2014. Oil and acrylic on canvas, 90 x 120 inches. Species Tulips and Columbines, 2013. Oil, acrylic, and palladium leaf on canvas, 72 x 90 inches. Honeysuckle, 2014. Oil, acrylic, and gold leaf on canvas, 84 x 60 inches. Midnight in the Huntington Library Cactus Garden, 2014. Oil, acrylic, and gold leaf on canvas, 108 x 132 inches. Large Succulent Garden, 2014. Oil and acrylic on join paper, 54 3/4 x 33 1/2 inches. Huntington Library Cactus Garden II, 2014. Oil, acrylic, gold leaf, and collage on paper, 30 x 36 3/4 inches. Apollon, 2014. Oil, acrylic, and gold leaf on joined paper, 21 1/2 x 28 1/2 inches. O Camellia Sister of Tea, 2014. Oil, acrylic, gold leaf, and collage on paper, 28 x 28 inches. Succulent Ascension with People, 2014. Oil, acrylic, and gold leaf on joined paper, 62 x 21 1/2 inches. Offrande à Apollon, 2014. Oil, acrylic, and gold leaf on joined paper, 21 1/2 x 28 1/2 inches. DC Moore Gallery is pleased to present Robert Kushner: baroque. In this exhibition of new paintings, Kushner fuses plant forms with references to the global history of ornament to extend his exploration of the conceptual and political implications of the decorative. A catalogue with an essay by Faye Hirsch accompanies the exhibition. The scale of the paintings on canvas situates us in an immersive landscape where flora takes on the presence of sculpture. Kushner achieved the animate quality of individual plants, including quince, phlox, and Queen Ann’s lace, by working from life in Waldoboro, Maine. Memories of the Huntington Library Botanical Gardens, near his childhood home in California, inspired the renditions of cacti and aloe. Kushner’s inimitable use of color freely ranges across metallics, pastels, and near-neons. The painted plant forms materialize out of what Hirsch describes as “optically complex passages” created by the comingling of marbleized, aqueous grounds, dense bands of color, and luminous patches of gold and palladium leaf. Textiles, Japanese screens, and modern painting inform these compositions and the play with space. 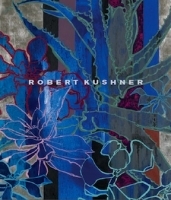 Robert Kushner has exhibited extensively in the United States, Europe, and Japan. Solo exhibitions have taken place at the Whitney Museum of American Art, Brooklyn Museum, and Philadelphia Institute of Contemporary Art. His work is featured in public collections such as The Museum of Modern Art, NY; The Metropolitan Museum of Art, NY; Whitney Museum of American Art, NY; National Gallery of Art, Washington, DC; Philadelphia Museum of Art, PA; San Francisco Museum of Modern Art, CA; Tate Modern, London, UK; and Galleria degli Uffizi, Florence, Italy. Publications on Kushner’s work include the monograph Gardens of Earthly Delight (Hudson Hills Press, 1997) and Wild Gardens (Pomegranate, 2006). In 2012, Kushner edited an important volume of art criticism by Amy Goldin (1926-1978) titled Amy Goldin: Art in a Hairshirt (Hudson Hills). The New Yorker: "Robert Kushner"